I struggle with where to start in sharing my story. For months I have longed to share my heart and experiences with you but words never seem enough. They never seem to flow. However, here I am beginning a journey I am not sure I am ready to take, though I firmly believe The Lord is asking me to step forward in this. I pray that my journey and all I have learned and continue to learn would bring comfort and peace. And not for my sake but for the sake of the gospel. I was blessed to have this life inside me. I had dreams for this little person, life plans, images of what he/she would look like, sound like. What his/her personality would be like. What the Lord had planned for this little human. I was CRAZY excited The Lord had chosen us to raise this precious little babe. However, at our 9 week appointment where we would be getting our first ultrasound, We found out we miscarried. During the ultrasound, my doctor (who was super gracious) was seeing two (maybe three) babies on the screen but no heartbeat. They were measuring in at 7 weeks which was two weeks behind what I was suppose to be. He did not want to confirm since he was kind of confused on what he was seeing, so he sent us to a radiologist to get a formal ultrasound. Although we received an ultrasound we were told we would not hear from our doctor with the results until Monday. We were left with zero answers and was so confused on what was happening. I desperately wanted to cling to the hope that the ultrasound had been mistaken and that our babies were ok. I clung to the truth that God was God and He was good. I prayed for a miracle. Though, I knew what was happening. It could not be avoided or denied. 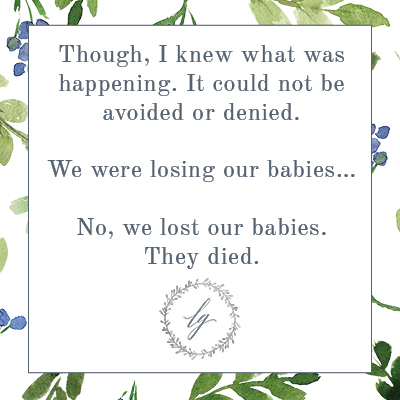 No, we lost our babies. They died. And there was no bringing them back. That night my doctor called and explained the results of our ultrasound. It was as we feared. They did not measure 9 weeks and there were no heartbeats. He did not want to completely confirm because again he did not want to provide inaccurate information. Over the course of that whole next week, we had three more ultrasounds and two more blood draws only to confirm what we already knew. That was hard. Knowing we had lost our babes but not having a medical confirmation made the false hope fan into flame. Moments after I hung up the phone with my doctor, I sat in our stairwell and bawled. I mean crying so furiously my body was shaking and I lost all sense of reality. My heart broke into pieces that day. I had never felt so much emotional pain and I had zero idea how to handle it. My husband (in all his graciousness) did every possible thing he could think of to help but the reality was in that moment, there was no helping. I was broken. My body failed me, my God failed me, and my babies were dead. Everything was out of my control. I was defeated and shattered. Hours later, Nathan carried me to bed. I continued to weep but eventually fell asleep and woke the next morning feeling empty. As I stated above, my doctor did not want to confirm a miscarriage until he noticed a continual decrease in my HCG hormones. However, Nathan and I knew there was nothing left to do but wait. When Saturday morning came, I already felt my body changing. My heart changing. There was no more bloating, no more tender breasts, no more anything. I was pregnant but my body was no longer supporting life. There was no more excitement or anticipation. Our one and only ultrasound and no heartbeat. My heart was confused and overwhelmed. It was wounded and being 100% honest, I did not know whether I could walk through it. That same Saturday, Nathan took me to Palm Springs to grab some lunch and do some shopping. Just to get my mind off things. We went to Chipotle and I remember loving that I could finally chow down a burrito without wanting to vomit and then the hate came. I hated that I could eat that burrito. I hated that my body felt normal. I hated that everyone around me was living their lives and they had no idea what we were going through. What I was going through. You all do not need a detailed recollection of that weekend, however, I want to share our Sunday morning with you. Because it is the heart of church. God’s people. That Sunday we went to church and the moment I saw one of the ladies I worked with at the clinic, I started telling my story. I explained what the doctor had said and how he gave me three options I could choose. The first being I could wait for my body to naturally deliver the babies (this could take weeks before it happened), the second was a pill I could take to jump start the delivery (I would not have to wait any amount of time with this one), and the third was a D&C. ( I feel like most of you know what that is) I explained to her how torn I was. I did not know whether I wanted to wait but I could not risk the possibility of my babies actually being alive. As the service was starting she told me she would talk more with me afterward. Toward the end of the service, our pastor gave the people an opportunity to be prayed over. Nathan and I usually did not partake in this, however, we desperately wanted comfort and prayer. We approached our pastor and asked prayer for what was happening. His heart broke for us. His words were sincere. He did not ask our Father for a miracle, however, he asked for comfort. For peace. For His arms to be wrapped around us. He understood the reality of our situation and he did not pray for false hope. He simply asked our God to be near us. At the time I did not really process this prayer, however, looking back I greatly appreciate his words over us. “There is nothing to fear over any choice you make. You do what you need to do for your body. Even a year later, this truth hits the deepest parts of my soul. Tears still fill my eyes at the realization that our babies are with Jesus. He is watching them grow. Keeping them safe. They will never feel pain or have anything to fear. They will never have to walk through life in this broken world. However badly I want our babes here with us, I know they are with the King of Kings. That night we made the decision to let my body pass the babies naturally. Exactly two weeks later, 45 minutes after we returned home from a weekend at my dad’s, the cramping began. Except they were worse than cramps. WAY WORSE. I had never been in so much pain. I seriously cannot even put into words how excruciating it was. How humiliating it was. I was thankful for serious pain medication that I took shortly after the worst was over. Nathan and I laid on the couch and within moments I was asleep and I awoke in my bed the next morning. It was over. Our babies were truly gone. Because this post is already the length of a book, I will stop here for the time being. This is long. I get that. Its very detailed (though I am leaving so much out) and I get that too. However, I process out loud. But I know I am not alone in this. When it comes to miscarriage, our society is silent. Women feel they do not have a voice and I want to change that. I want to share my story. My whole story because that is how I began to heal. I verbally walked through my pain. I will explain more about this in another post, but for now I will say this is just the beginning. There is much I want to share but it has to start with a story. A long story. A sad story. But its mine. I own it. And I would not change it. The Lord has written it for me. I hold it with an open heart, and I am eager to see how The Lord uses it.